No one really knows why, but for an open wound, simply applying suction dramatically speeds healing times. (The theory is that the negative pressure draws bacteria out, and encourages circulation.) But for almost everyone, that treatment is out of reach–simply because the systems are expensive–rentals cost at least $100 a day and need to be recharged every six hours. No more. Danielle Zurovcik, a doctoral student at MIT, has created a hand-powered suction-healing system that costs about $3. 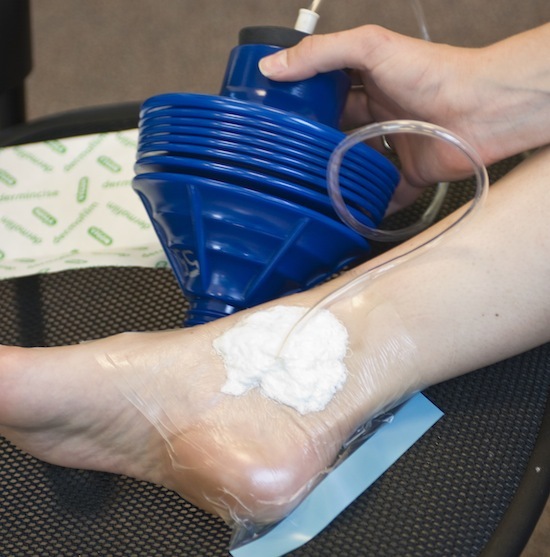 The device is composed of an airtight wound dressing, connected by a plastic tube to a cylinder with accordion-like folds. Squeezing it creates the suction, which lasts as long as there’s no air leak. What’s more, where regular dressings need to be replaced up to three times a day–a painful ordeal–the new cuff can be left on for several days. Zurovcik originally intended to field-test the device in Rwanda, but then the Haiti Earthquake struck. At the request of Partners in Health, an NGO, she traveled to Haiti with 50 of the pumps. Currently, Zurovcik is verifying the healing benefits of the device, and developing a new model that can be readily carried and concealed. The one technical hurdle that remains is ensuring the bandage seals tightly–but after that, the device could benefit a huge portion of the 50-60 million people in the developing world that suffer from acute or chronic wounds.